I've been holding this coin for a while now. I like the fact that NEM created a blockchain and platform for smart contracts, comparable to Ethereum. But instead of pushing all the responsibility to the developers like with Ethereum (look at what happened to Parity wallet), with NEM you need to use their Java API to build smart contracts on top of NEM. This gives the developer a little less flexibility, but it also takes away a lot of potential bugs and increases reliability. A lot is moving with NEM recently, in China and worldwide. OKEx will trade NEM on Christmas day. 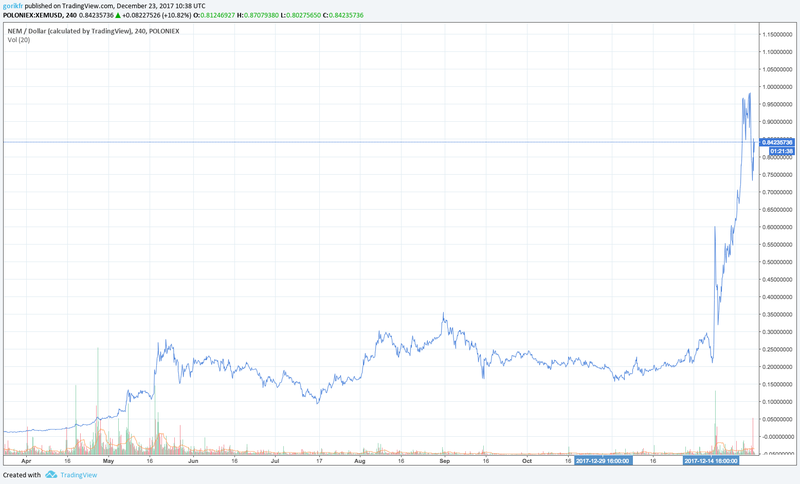 They are not listed on Binance yet, once that happens I foresee another big boost.